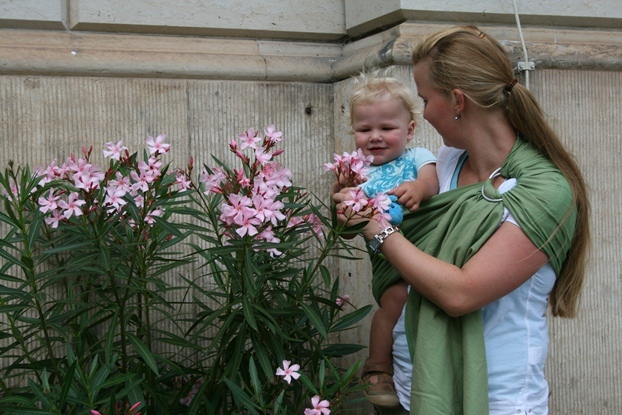 Ring slings are a one shouldered carrier suitable for newborns through to toddlers. A ring sling can be used the same way as a pouch sling – the difference though is that a ring sling is adjustable so one size will fit all wearers. The ring sling is adjusted by pulling the end of the fabric through purpose made sling rings, allowing baby to be adjusted upwards and inwards so that they are nice and snug against the wearers body. Always make sure to use a ring sling that has been made with purpose made sling rings as these have been weight tested for safety. Never use a ring sling if the rings have a join in them as they may pull apart causing the sling to become dangerous. Babies can be carried in several different holds in a ring sling – upright cradle, tummy to tummy, hip and back. The most common carry with a ring sling is the hip carry as shown below. As with any baby carrier, positioning is very important when carrying your baby. For an upright cradle carry with a ring sling, always make sure baby’s face is clear of fabric and that their chin is not pressed into their chest – an easy way to make sure the airway is clear is to make sure you can fit two fingers between baby’s chin and their chest. For carries with an older baby or toddler where their legs are out, always make sure their knees are higher than their bottom. This can be achieved by spreading the fabric of the sling right up to the backs of your child’s knees, creating a comfy seat for them. This ensures optimal positioning of baby’s developing hips and spine. The images above and below show the correct positioning with the child’s knees higher than their bottom. When carrying your child in a tummy to tummy, hip or back carry, make sure to pull the fabric nice and high up baby’s back, making sure the sling is nice and snug. This ensures that your child’s back is well supported. The fabric of the ring sling should be nicely spread across the wearer’s back, as pictured below. This allows the child’s weight to be evenly distributed across their caregivers shoulder and back and makes for comfortable wearing without any painful pressure points. The fabric should cap the shoulder, it should not dig into your neck. Tail = the end of the sling that hangs through the rings. This can be held over your child if you’re caught in a rain shower, to cover your child for sun protection or as a breastfeeding cover if desired. Rails = the edges of the sling. The top rail goes behind baby’s back in upright carries and can be adjusted to bring baby in closer to you. The bottom rail goes under baby’s knees in upright carries and can be adjusted to lift baby higher up your body – their bottom should be about level with your tummy button. For more information about ring slings and to find instructions complete with photos, please visit Slingbabies! Storchenwiege ring sling images used with permission. This entry was posted in Ring Slings and tagged baby slings, babywearing, ring slings, storchenwiege, Storchenwiege ring sling. Bookmark the permalink.